Amazon.com description: Product Description: Finally, an introductory textbook from the Web Warrior series that covers both HTML and XHTML! 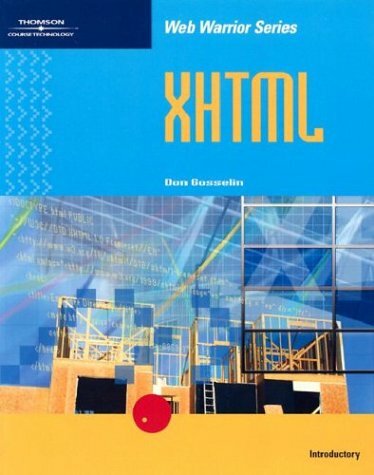 Providing students with a tool that not only teaches the basics of HTML, but also prepares them for the eventual migration to XHTML, this book is perfect for the student who can utilize their core HTML skills to develop XHTML pages. XHTML, the integration of XML with HTML 4, makes it easier to create and update Web pages while offering more flexibility because of its platform-independent design. Thus, applications running over PDAs, cell phones and televisions will stay consistent in their presentation. Furthermore, the importance of XHTML as an essential Web development tool has been reinforced because it has been chosen to replace HTML as the default Web tool by the World Wide Web. About: Finally, an introductory textbook from the Web Warrior series that covers both HTML and XHTML!